When you’ve recently travelled back from Sydney to London on a 24 hour flight and had to suffer the injustice of an 11 hour time difference, presumably you could be forgiven for ignoring your friends. For a week or so after I arrived back in London, I hibernated in my flat and barely saw daylight other than to ward off hunger pains with the occasional visit to the shops. However there came a point when the explanations I gave for my absenteeism such as “I’ve been so jetlagged,” or “I’ve not slept,” were no longer acceptable excuses from not partaking in the social norms of reality. Eventually the call to order arrived, a message through my hotmail account asking if I was still alive. And so it was that I awoke with a jolt, literally and figuratively as my stomach also stirred with grumbles for a satiable fill of my favourite pastime, a good meal out with friends. So it was on a crisp autumnal evening that I walked down Conduit Street to my destination, Via Condotti, an Italian ristorante named after Rome’s most famous shopping strip (Via Condotti) and itself located within the reaches of some of London’s finest shops. As I approached the restaurant, I was met with a beguiling entrance which laid claim to a charming dining room lit with warm soft hues, peach and magnolia walls and light wood floors. White linen tables and leather backed chairs had been arranged comfortably throughout. I set eyes on my friends. Hugs and kisses all round ensued and conversation started to flow like wine. So it was some time before we eventually placed our order from a menu abounding with such choice as to span the four courses which is typical of Italian restaurants. A wine list encapsulated purely Italian drops, although the champagnes were French. Starting from about £20, the bottles were classified by both type and region. After placing our orders, a heaving breadbasket filled with many delicious goodies including delicately salted focaccia and crispy, crunchy wafers of Sardinian pane carasau got us on our way. A starter of culatello ham, a specialty cold cut from Parma, was delicate in flavour and served with bitey, fresh rocket and mellow pecorino cheese. A squid ink tagliatelle was pleasant: the squid soft and delectable, the tagliatelle appropriately blackened and cooked to al dente. Lightly immersed in olive oil, the flavour of the dish was delicate, although I yearned for a slightly heavier touch of fine herbs to boost its aroma. For mains, a sirloin steak (with a £5 supplement) on a bed of spinach was a winner. A fine piece of meat, it was tender and succulent, slicing like soft butter. Accompanied by a perfectly caramelised piece of apple perched atop, it proved an animated, delicately sweet contrast against the depth of flavour from the meat. A chicken paillarde (flattened chicken breast) was done simply, but tastily. 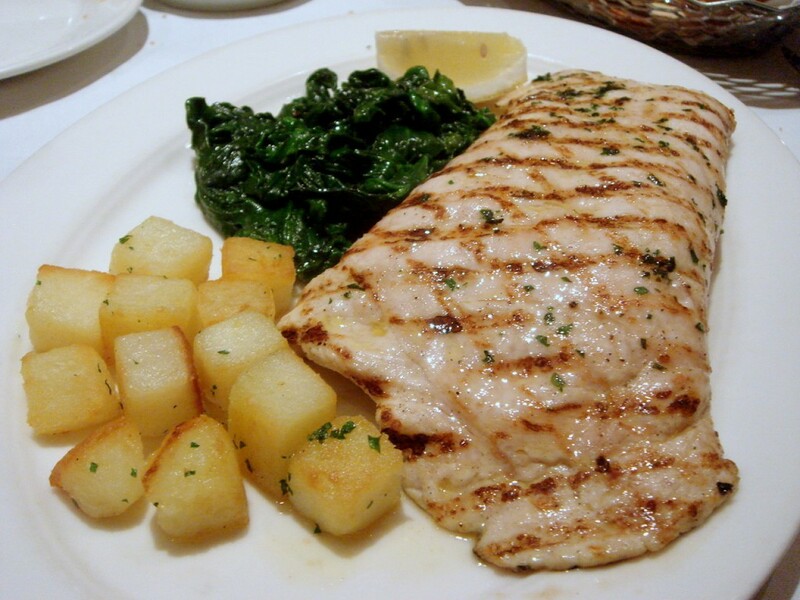 Char-grilled, it was served with roasted potatoes and spinach. A lemon tart was wonderfully creamy with a light lemon flavour. However it lacked the tartness of biting citrus. The pastry also proved more doughy in texture than biscuit-y. But the outright winner of the night was the tiramisu. Enclosed in a crispy pastry shell it was heavenly, wonderfully creamy and light so as to transport you onto a fluffy white cloud. Before I knew it, three and half hours had passed. Like the breadbasket, I was heaving full from three enjoyable courses and plentiful amounts of delicious bread. The cooking had been done simply, but done well. And with pricing such as theirs for this calibre of cooking and quality, the restaurant ticked many boxes. Combined with the enjoyable food was rapturous conversation and professional, slick service in a snug and intimate setting. It all made for a delightful evening and it definitely beat hibernating at home. Price – £27.50 for three courses. Excludes drinks and service.